NEW BEDFORD, Mass. 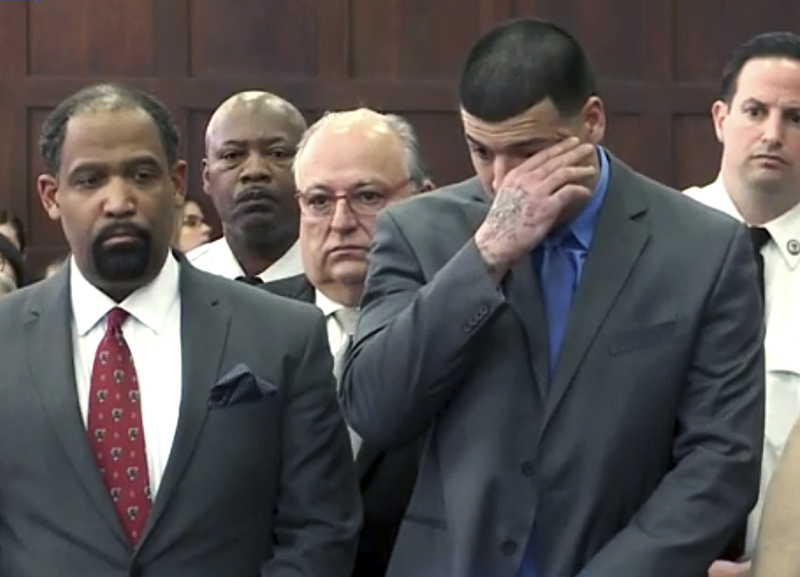 (CN) – Pro football star-turned-convict Aaron Hernandez’s family got information about his suicide earlier this week via “salacious details on Twitter,” his attorney told a New Bedford Superior Court judge on Friday. “It violates every code of decency,” George Leontire, who has been representing Hernandez for years, said to Judge Thomas McGuire during a hearing on an injunction to preserve evidence surrounding the former New England Patriot’s suicide in his prison cell earlier this week. Leontire’s loud and expressive voice filled the open, empty second-floor courtroom where Lizzy Borden once stood trial. The short, long wooden benches – installed in 1830 when the courthouse opened – held about a dozen reporters and two spectators. “We are getting [all our information] from the media, and the media is getting it from sources who are government officials,” Leontire said after explaining the family has heard about several suicide notes Hernandez supposedly left behind, but has yet to see anything. Leontire suggested Hernandez was able to hang himself with a bed sheet in his cell because no one checked on him between 8 p.m. and 3:03 a.m.
Judge McGuire found both parties are interested in protecting the evidence in question, as Murray stated the investigation is ongoing and the state is also interesting in preserving the information. “The dispute here is what constitutes a proper investigation,” McGuire said. He issued an order specifying the items that need to be preserved, including video recordings of Hernandez’s cell; all of his property; photographs of the scene after his body was found; the state medical examiner’s autopsy results; and recordings of telephone calls he made up to 30 days before he died. Once one of the most promising young players in the National Football League – signing a $40 million five-year contract extension with the Patriots in 2012 – Hernandez was convicted of the 2013 murder of his friend Odin Lloyd. The conviction carried a mandatory sentence of life without parole. On April 19 – five days after a jury found him not guilty of a double homicide in Boston in 2012 – corrections officers found Hernandez hanging from the window in his cell. The medical examiner ruled his death a suicide.